At Electrical Apparatus, we understand the significance of your motor repair or manufacturing needs. 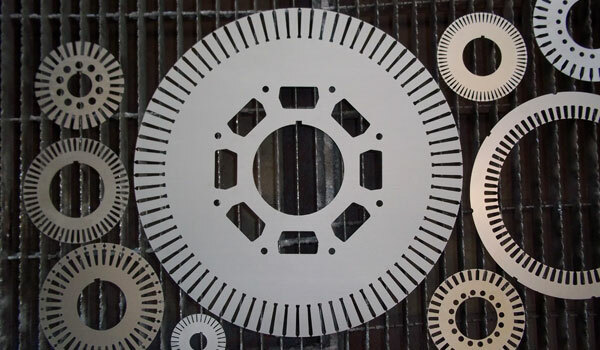 So we provide Stator, Rotor, Armature, Pole Piece, Flex Plate laser cutting to fit your needs. We have a team of talented technicians and an array of tools and equipment at our disposal to provide you with laser cutting services you can trust. Whatever you may need to complete your project, we offer cost-effective solutions for any problem you may encounter. Some housing repairs can be made – and more! Our mission when it comes to laser lamination is to offer the best, quality silicon steel laminations for motors, rotors, armatures, and stators in a timely manner. Choose straight or overtime preferences to get your service complete when you need it. Use the form on the right to contact us today and request a quote for your laser cut lamination job. You are under no obligation and we can provide you with the right information to get the job done fast. Take some time to review our site and learn about all of the great services we can provide your shop or project. From rotor repair to rebar and laser cutting to laser lamination, we are ready to help you. With over 30 years of experience in the rotor business, we understand what it takes to get the job done right! We offer fast turn-around times and expert support by experienced technicians that will make Electrical Apparatus your only choice. So, what are you waiting for? Electrical Apparatus can provide the high-quality laser cut lamination service you need at competitive rates! Get your quote now! Complete the form on this page and we will contact you soon.